Volvo have had a splendid 12 months. Despite ‘diesel-gate,’ their current range for fleet anyway, of mostly diesel models, have been a resounding sales success. Led by the XC40, which sold faster than Glastonbury tickets, Volvo could easily have sat back & taken a breather. However, they have not rested on their laurels, recently adding a new V60 estate to their range. 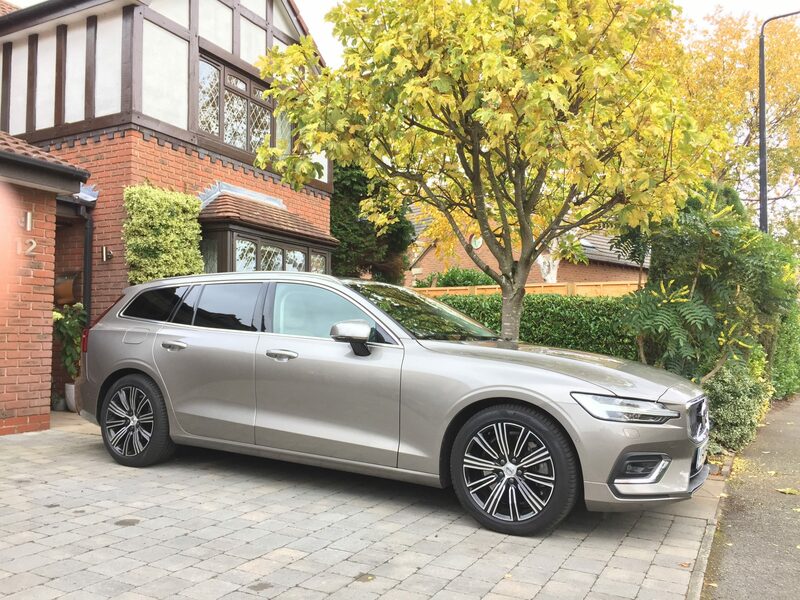 Company Car & Van had nothing but good things to say about the larger Volvo V90. Could the V60, which looks just like a smaller version of the V90, be as impressive ? With a V60 D4 Inscription delivered to our offices, we were eager to find out. Volvo stated that the V60 is the modern successor to the V70, 850 & 760, cars that were practical, but never eye-ctaching. 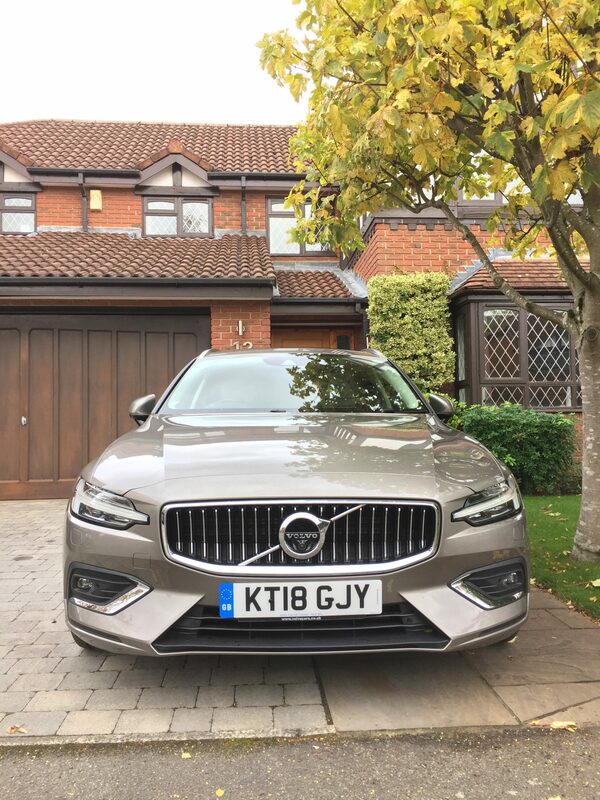 The V60 is definitely more striking than these, coming as it does with a wide, chrome Volvo front grille, Thor Hammer headlights, a deep front pyramid air intake & a slanting front windscreen. The rear end is flatter than the one fitted to the V90, although the rear boomerang light clusters are still in evidence. The interior of the V60 mirrors those found in the current Volvo line-up, with the centre console dominated by the Volvo 9″ vertical touch screen. All V60 models feature the Volvo Sensus Connect set-up. We’ve written at length about this before. It takes a few days of driving the Volvo range, including the V60, to get used to Sensus, which once mastered is excellent. Sensus offers you the choice of three screens. 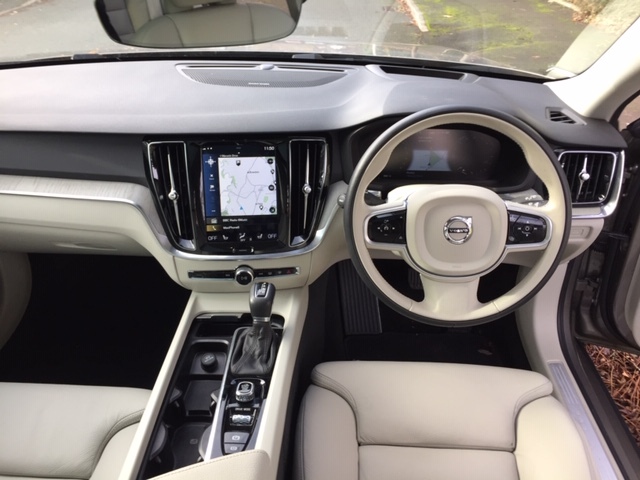 The screen that is on permanent display, offers the four main options of SatNav, Audio, Phone & Connectivity, in our case, AppleCar Play, with the car’s heating controls at the base. Scroll left to access the Car Function set up screen, where you can turn on or off functions such as lane departure warning or StopStart. Scroll right & you enter the Car Applications menu, with access to the radio, Bluetooth, sound experience & car Apps, such as Spotify. It all works seamlessly & in the V60 is faster than before. Our only criticism of the Volvo set-up, is that the heating controls are fiddly to access & we would prefer these to have been stand-alone. Via the multi-function steering wheel, you can select cruise control with the buttons on the left, with the hands-free phone, audio & car data accessed with those on the right. In front of the driver, sits the 12.3″ active TFT drivers information display which contains the rev counter & speedometer & for our week in the car, mainly the SatNav road map. The quality inside the V60 is excellent, being right up there with the class leading German marques. It doesn’t matter which model in the range you choose, Momentum, R-Design, Inscription, or the Pro versions of these, all are beautifully built. 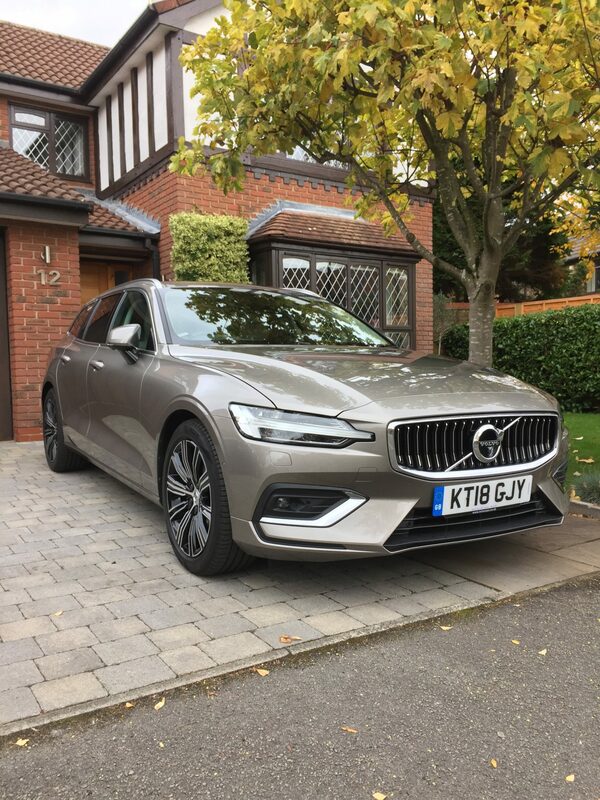 Our Inscription featured cosseting sand leather seats & with a 300 mile plus mostly motorway round-trip, with four adults on board the V60 was incredibly comfortable, with even my notoriously bad neck pain, often triggered by a long car journey, staying away. Front seat passengers have plenty of room & in the rear, two six-footers will sit comfortably behind similarly proportioned front seat occupants. Cabin storage is generous. There’s decent door pockets, with room for two drinks holders in the centre binnacle, which also contains the hand brake, starter button & gear lever. Lift up the tailgate & the V60 offers up 539 litres of space. 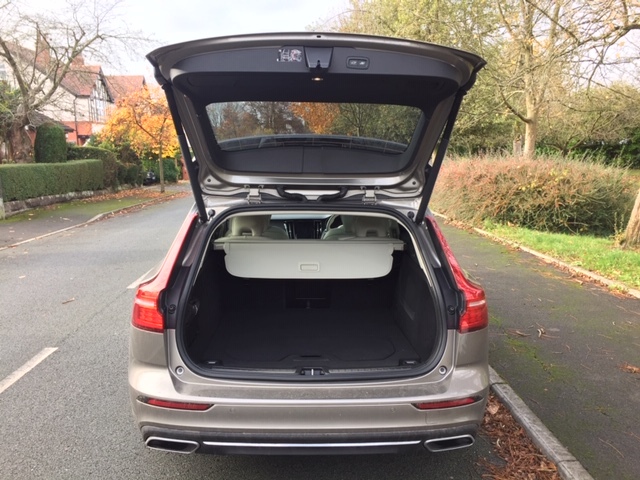 The floor space is both wide & flat & our test car featured Volvo’s clever lift up divider preventing your shopping sliding around the boot floor. The rear seats fold down by pressing two buttons located on the boot side. They lie almost flat to increase the space to 1,441 litres, very useful for a trip to IKEA or the local recycling centre. My family & I took a congsetion-free route to the North East on a Thursday morning, which took in the M6 to Tebay, the single lane A685 to Brough, the mostly dual-carriageway A66 to Scotch Corner & finally the A1 & A19 to Sunderland. There & back via the M62, the V60 was not only comfortable, it was quiet too. The onboard city safety with steering support safety system showed it’s worth when it kicked in milli-seconds before I braked near Preston, when a small van driver pulled out into the fast lane as we were almost alongside. Heavy rain on the A19 on our return slowed traffic to a crawl, so the on-board adaptive cruise control came into it’s own in almost zero visibility. The 0-62mph time of 7.9 seconds, proved it’s worth on the A685, enabling us to overtake a slow moving HGV with time to spare. I chose to make the journey in Eco mode & averaged just over 49mpg on the journey, pretty good for a large car with four adults on board. Other driving options offered are the self explanatory Comfort, Individual & Dynamic, modes, but to be honest, I found Eco perfect for my needs & used it for the remainder of my week. Claimed combined economy for our 190hp 2.0 litre diesel, is 61.4mpg , with CO2 emissions of 122g/km. 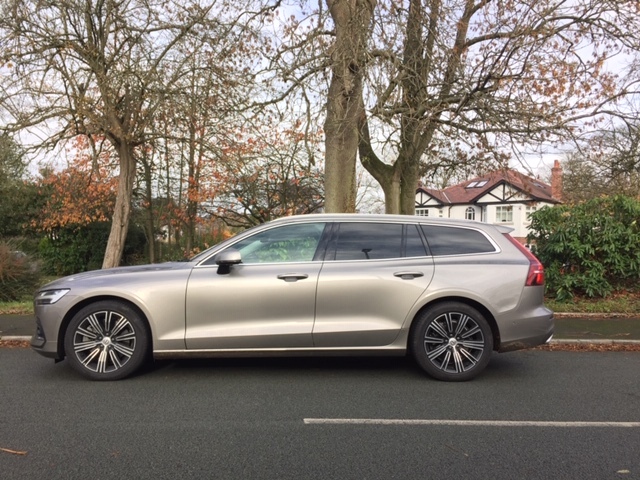 On our long journey, the V60 averaged almost 50mpg, whilst driving shorter distances for the remainder of our week, saw the economy drop significantly to 42 mpg. Whilst this may seem like a poor return, it’s comparable with the competition. In the main, whilst we have nothing but praise for the latest V60, the range does come with one caveat & that is the trim. Whilst the safety features are brilliant & are very welcome, to get the full monty of gadgets & apps, you need to spend more. The basic OTR price of our test model D4 Inscription, is £37,860. If you want the Convenience Pack, which offers power folding rear seat backrests & headrests, a grocery bag holder, the luggage protection net, front tunnel net pocket, 250v/150w 3 pin plug in centre console & 12v cargo area outlet, you’l need to find an extra £500. Or Intellisafe Pro, which brings you pilot assist, adaptive cruise control, blind spot & cross traffic alert, rear collision mitigation & auto dimming interior & exterior mirrors & you’ll need to find an additional £1,625. Most disappointing of all though, is that Smartphone integration for AppleCar Platy or Android Auto, will cost you a further £300, when this kind of connectivity comes free with Volkswagens Car Apps for example, on their latest model range. Volvo have always built excellent estates & the latest V60 is no different. Just like with the larger V90, what has dramatically improved though, is the style & quality you can now have if you choose a Volvo. 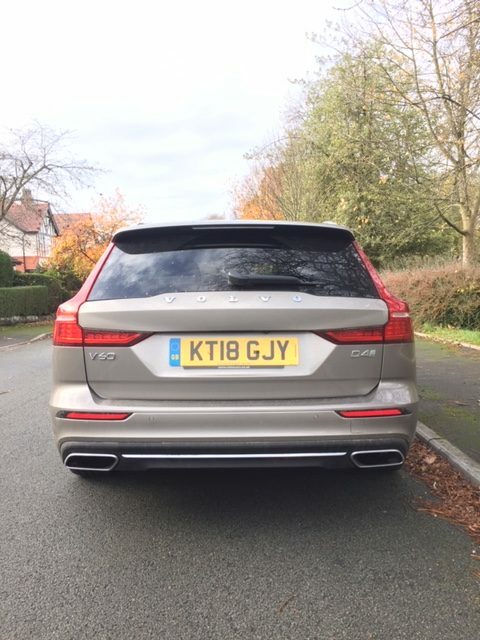 Where Audi, BMW & Mercedes-Benz have been making their estates luxurious for year’s, Volvo has finally produced something equally as nice, that it is also pleasingly in a Swedish way, different & to my mind anyway, is now a stand-out in the sector. There is something comforting about driving a Volvo estate, that I can’t quite put my finger on. If you are looking for a car in this sector, can I suggest that you test drive the V60. You won’t be disappointed. A Gothenburg Symphony Orchestra 4.25/5.